With Apple announcing its new Passbook digital wallet app for iOS 6 last month, speculation regarding the inclusion of near field communications (NFC) and mobile payment capabilities for future iOS devices has begun to increase. The speculation comes amid rumors of iPhone prototypes with NFC, although Apple has been said to be intentionally moving slowly on the mobile payment front. 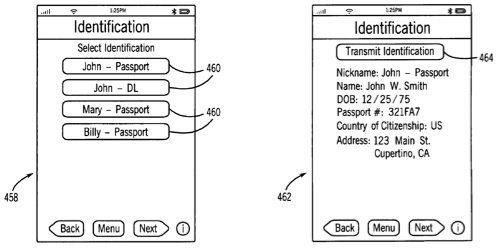 Now that Passbook has been revealed, today's granting of a new Apple patent for NFC-enabled transportation ticketing takes on additional significance. As noted by Unwired View, the disclosed "iTravel" application would handle a broad array of functions to assist with travel logistics. 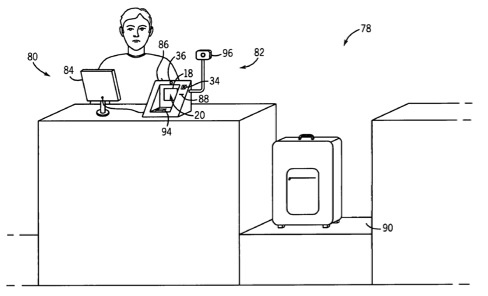 The main focus of the patent is how you would use your next iPhone with NFC chip at the airport check-in. It includes loading your ID info such as picture, retinal scan and fingerprint data from modern passports with embedded radio frequency identification tags. Collecting your ticket information from reservation confirmation e-mails/notifications, or extracting reservation images via optical character recognition software, barcode-reading software, or QR-code-reading software. Providing the necessary information at the NFC equipped check-in counter, and receiving the boarding pass with luggage info in exchange. Using the stored ID to pass through airport security, etc. Apple's iTravel patent application has been known for some time, having been filed in September 2008 and published for public viewing in April 2010. But with the patent now having been granted by the U.S. Patent and Trademark Office, Apple has broader protections should it choose to launch such an application. It is unusual for Apple to so thoroughly document an actual iOS application concept that has yet to see the light of day in a patent application, and it is unclear exactly why Apple has chosen to do so. But with NFC technology being a bit slower to establish itself than originally hoped, perhaps Apple thought it would be able to move faster on its idea. Alternatively, Apple may have already discarded this specific implementation, but with Passbook making an appearance later this year and NFC perhaps also being included, Apple's iTravel concept may still find its way into iOS devices in some form. Using the stored ID to pass through airport security, etc. The TSA can barely figure out X-rays, much less ID information stored on phones. Don't understand why patents like these are given. What a screwed up system. But not things that have existed (like the above) in a form for centuries. Tacking on a " ... , but on a computer" does not make it a new idea worthy of protecting. So a: "Passbook where you store your itinerary .... but on a COMPUTER!" Of course this would require that people actually read and evaluate patents, and we all know this will never happen, and that is why I really think patents in general and software patents in particular should just be eradicated and people should rather move to trade secrets and first-to-market. That would benefit the consumer of course, and you would not want that, right? Currently the patent trolling going on at the moment is starting to really annoy everyone. 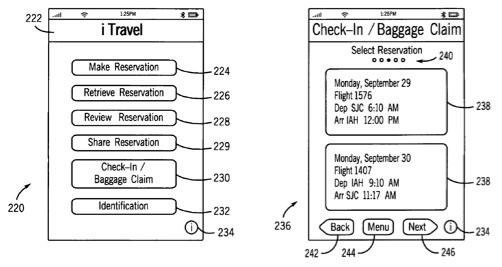 Is there more to this patent than "Use NFC for airport check-in & reservations". Are we going to see a patent for every effective usage of NFC? "Use NFC for store checkout" patent. "Use NFC to unlock & start your car" patent. Is there some design/implementation innovation here? Or are they just patenting a business idea? Again, if Apple did not file patent applications, their competitors would anyhow. Like who, for instance? This patent thing is getting way out of hand. I've witnessed (whether they actually did or not, I have no idea) people from this very forum change from Apple to another product due to litigation thuggery on Apples behalf. Pretty sure patents were given for the inventors of the typewriter, back when the concept was "novel." I would hope so, the Type Writer was a piece of machinery that revolutionized how everyone wrote documents and letters or anything on paper. It was a mechanical device that did something no one had ever seen before. That's not what Apple is patenting here though or anything like it. If your trying to compare Apple to the inventor of the type writer you are crazy. It seriously would be more like someone invented the type writer then Apple came along and patented the semi colon button. It was a character that already existed, they just made another button for it... worthless patents by Apple it will never end. It amazes me that people continue to bash Apple for applying for patents for novel concepts that they come up with. If they don't apply for one, someone else will. The USPTO exists and will issue patents when called for according to the laws, rules, and regulations that exist, and based on the experience and expertise of those working at the USPTO. Patents were created by law to foster invention, yet everyone seems to think that all they do is stymie it. Write to your congressman if you don't like the laws. Now Apple will apply for another ban on nexus for having NFC chip based on inovation that they created (NFC). Maybe Apple should patent Traveling activity. Then it would be perfect. The invention of a typewriter was huge. It can't be compared to patents "like this one".